Shami, Bhuvneshwar and Bumrah are the three specialist pacers in the squad. The Board of Control for Cricket in India (BCCI) recently named the 15-man squad for the World Cup in England and Wales, scheduled to start on Thursday, May 30. 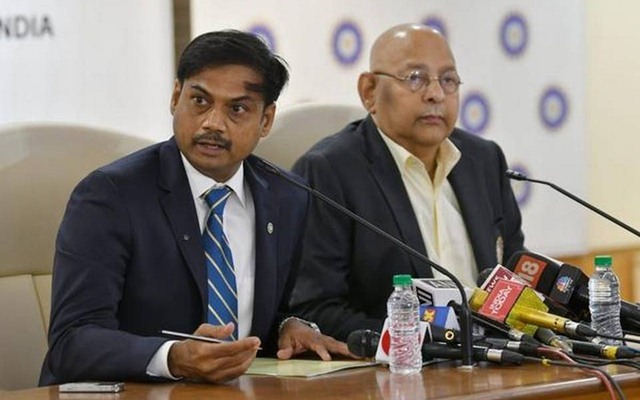 Chief selector MSK Prasad and secretary Amitabh Chaudhary named the squad in the press conference in Mumbai. After all the speculations and analysis, the names were finally put forth and there were a few surprises. Prior to the squad announcement, the discussions on who should be India’s fast bowlers for the tournament did the rounds. Mohammed Shami, Bhuvneshwar Kumar and Jasprit Bumrah were named as the specialist seamers with Hardik Pandya as the fast-bowling all-rounder. In the meantime, the selectors also named a couple of backup pacers for the mega event. Khaleel Ahmed and Navdeep Saini are the bowlers who would come to the fore if any major injury concerns arise during the tournament. As far as Khaleel is concerned, he made his debut against Hong Kong in the 2019 Asia Cup in the United Arab Emirates (UAE). Thereafter, the left-arm speedster impressed in the five-match ODI series against Jason Holder’s Windies. Unfortunately, the youngster didn’t get much of a chance thereafter and got opportunities in only a couple of encounters against Australia and New Zealand in Sydney and Hamilton where he couldn’t pick up a wicket. On the contrary, Saini has been in contention for a place in the national squad. He was included in the squad for the one-off Test against Afghanistan in Bangalore. But he didn’t get a chance. The Delhi fast bowler is currently plying his trade in the 2019 edition of the Indian Premier League (IPL), representing the Virat Kohli-captained Royal Challengers Bangalore (RCB). Though he hasn’t picked up a whole of wickets but has done exceptionally as far as hitting the right channels and cranking up the pace with the ball is concerned.